Are you looking for a new mountain bike? 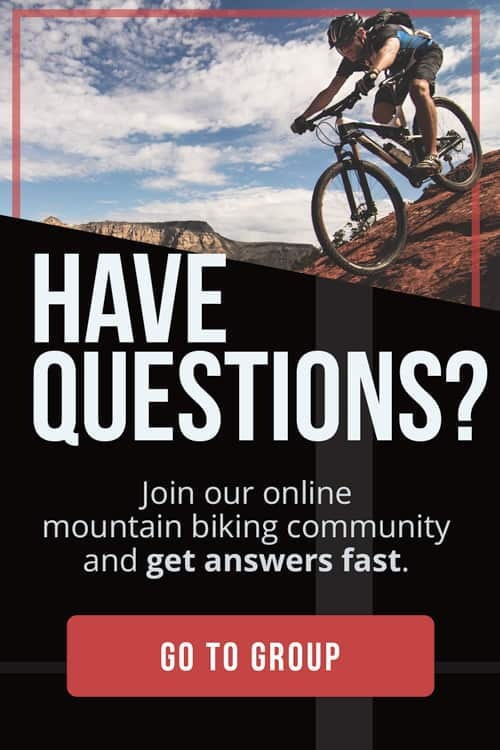 Or do you simply want to learn more about the different types of mountain bikes? Then, this article is for you. 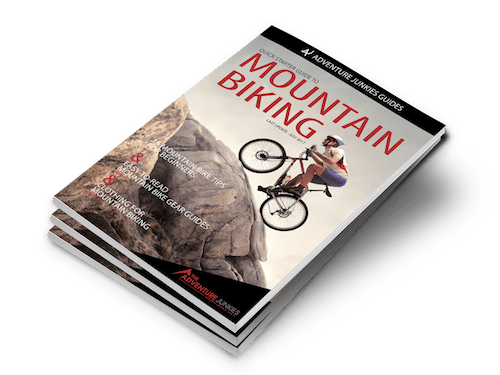 Below, we cover all the most popular mountain bike types out there, from specialized downhill mountain bikes to those for occasional outings. While you may think that a mountain bike is just a “mountain bike,” there are actually quite a few different models, types and designs. Each is made for a specific purpose, which is something to think about before you spend money on a new bike. At The Adventure Junkies, we offer you lots of great tips and advice about everything related to mountain biking. 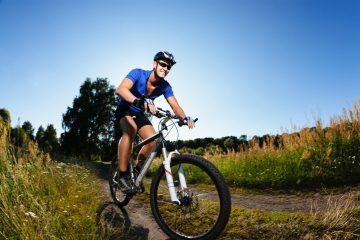 So, read on to find out more about the various types of mountain bikes. 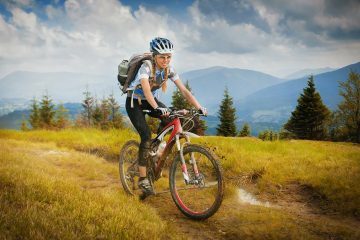 Considering what kind of mountain biking you’re going to do is essential if you want to find the ideal bike for you. Will you be riding cross-country? Or are you going to do some serious downhill riding? These kinds of questions matter. So, take the time to figure out the exact purpose of your new mountain bike before spending lots of money on it. 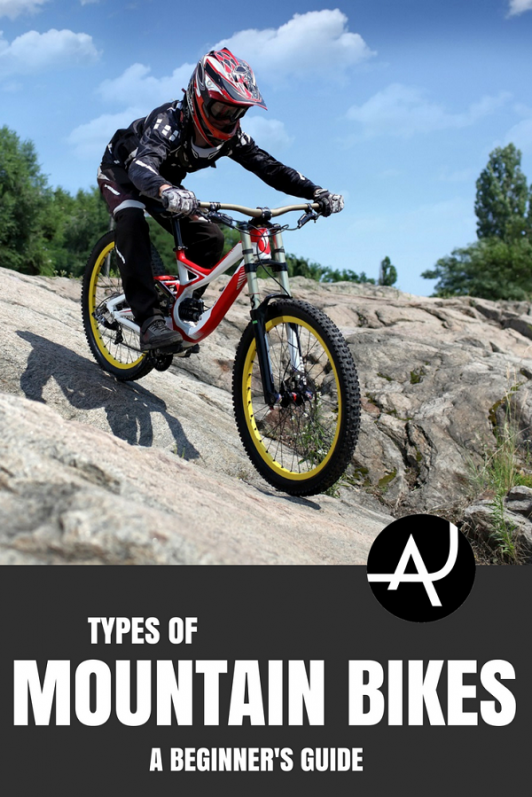 To help you out, we’ve compiled an overview of the most popular types of mountain bikes below. From XC bikes to downhill bikes and fat bikes, you’ll find them all here. Trail mountain bikes are perhaps the most commonly used mountain bikes out there. This specific category of bike isn’t related to any particular kind of racing. It can be used for pretty much everything. Trail bikes are great for everything from climbing and descending to meeting up with friends and simply having a bunch of fun outdoors. They have more relaxed angles, according to Bike Radar. This gives the rider more confidence during descents. Trail bikes also have wider handlebars and shorter stems while their tires feature more aggressive treads. This is a mountain bike that can do it all, emphasizing on a combination of decent overall weight, fun and efficiency. If you’re not a specialized mountain biker, this is the type of bike you should go with. Also referred to as XC mountain bikes, cross-country mountain bikes are actually a lightweight type of trail bike. They focus more on climbing prowess and higher speeds. These bikes are great if you want to cover a lot of ground quickly and make fast ascents. Cross-country mountain bikes have an efficient design and low weight. They also have steeper head angles (the angle between the head tube and the ground), which makes the bike turn faster and better at climbing. This does, however, also make it harder to control the bike on steep descents. Keep this in mind. They’re ideal for climbing and fast trails. This type of mountain bike is often the one you see in most of the bike shops. 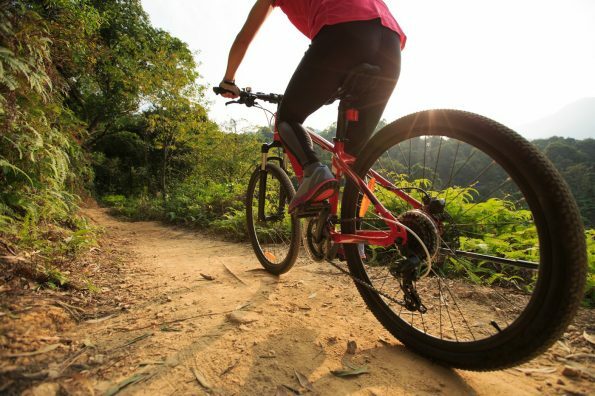 If you want to step up your mountain biking game, or even consider getting competitive, choose a cross-country mountain bike over the slightly heavier trail bikes. All-mountain or enduro bikes are the types of mountain bikes that are used for more serious mountain biking. You can regard them as trail or cross-country mountain bikes on steroids. They have stronger frames and more travel in their suspensions. This helps you on rougher, more complicated and more technical trails. At the same time, they’re still light and maneuverable enough for fast ascents. These bikes are perfect if you’re riding on mountainous terrains, with plenty of steep ascents and fast descents. Because they’re used on fast and technical trails, these bikes usually have a special device that prevents the chain from falling off. They also come with lots of rear gears. Buy this type of mountain bike if you’re serious about mountain biking. If you’re planning on doing some quad-burning climbs, speedy descents and know you’ll have to maneuver through various obstacles, this bike’s for you. Fat mountain bikes have largely oversized tires with low air pressure. This gives them much more traction in sand, snow or other less solid ground types. This type of mountain bike is popular among adventurous bikers. They’re fantastic for off-the-beaten-track riding. Featuring a sturdy design and plenty of racks on which you can carry gear, fat bikes are what you should be looking for if you like heading into the wilderness. Their unique look also makes them popular with people who just want something that looks different. 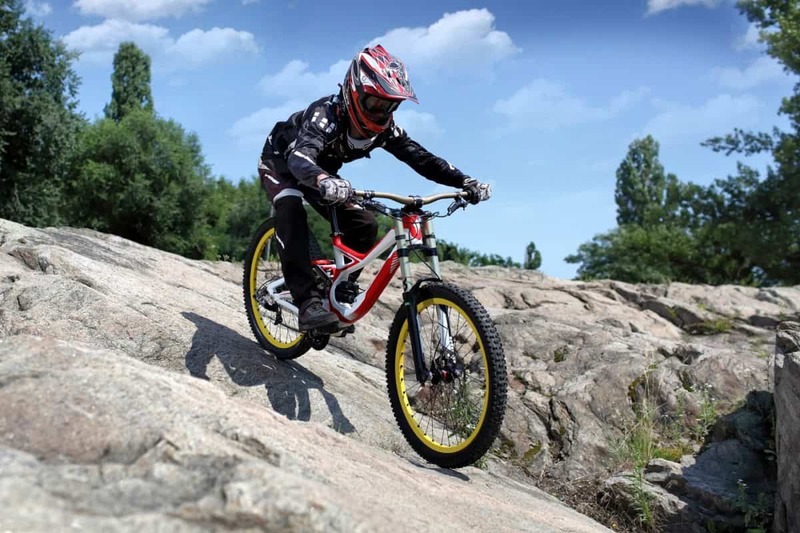 As their names implies, downhill mountain bikes are designed for downhill riding. Their sole purpose is to allow riders to fly down steep and technical trails as fast and efficiently as possible. Featuring lots of travel in their suspension, both front and rear, downhill bikes are optimized for traction, support and shock-absorption. These bikes are large and tough, not focused on being lightweight. They also have a smaller head angle, which gives you more control on fast ascents. Their tires are wider than trail bikes’, also featuring wider rims. Downhill bikes have low-placed seats. Disc brakes are standard while a chain guard keeps the chain where it belongs during rough and bumpy descents. Also, downhill bikes may not have clip-in pedals because many downhill riders prefer not to have their feet clipped in. This allows them to get off their bike in case something goes wrong. 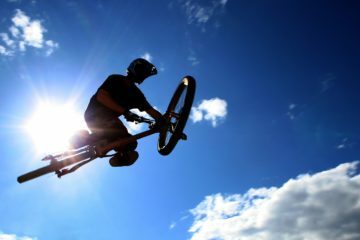 Consider getting one of these highly specialized mountain bikes if you love going downhill and doing some high jumps as well. Keep in mind that these bikes are heavy and not suitable for long and steep ascents. You’ll most likely have to push it uphill or get a lift to the trailhead at the top. They’re not cheap. You’ll want to spend some money if you’re serious about this dangerous type of mountain biking. Making sure you have the best and toughest materials is a good idea.